New Delhi, Dec 12 (IANS) The rise of insurgency in Punjab and the Sikh community's 'militant mindset' during the mid 1980s was induced by a ruthless police force whose repressive measures compelled people to revolt, says a former police chief. 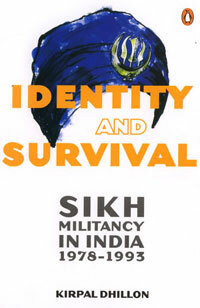 Kirpal Dhillon draws on his experiences as Punjab director general of police (DGP) to provide an in-depth analysis of Sikh militancy in his book 'Identity and Survival: Sikh Militancy in India 1978-1993' launched here Monday evening. 'During my brief period in Punjab, I understood and experienced how the entire gamut of operations starting from police, government, and intelligence worked in the state. 'The police was extremely ruthless and they failed to understand that repressive measures will increase insurgency and militant mindset among the community,' Dhillon, who was DGP from July 3, 1984 (soon after Operation Bluestar) to Aug 22, 1985, said. According to the author, Bhindranwale always advocated the freedom of the Sikh community, but whether he 'genuinely' wanted Khalistan or a separate state for the Sikhs, is still unclear. Dhillon, also former joint director of the Central Bureau of Investigation (CBI), also spoke eloquently of how militancy in Punjab and Kashmir was vastly different yet similar when it comes to repressive measures taken by those who are supposed to maintain peace and stability. In his book, the author has also brought forward the ethnic importance of minorities in the country, including Sikhs, Muslims and Christians. The book is priced at Rs.395 and brought out by Penguin Books India.